Who really wants BSN degrees? I used to call the BSN degree the BS degree as to have it is BS to begin with...or so I thought. But anyways, large hospital systems that hire RNs want BSN prepared nurses as they are seeking higher reimbursement rates. As healthcare is a business, they are looking to hire BSNs as research shows that nurses that are BSN prepared have higher satisfaction rates. That and improving hcahps scores means happier patients and more successful outcomes = meaning more money and higher reimbursement. Having an BSN does open up more opportunities. It has for me, and I'm not stopping there. Education does give you a benefit for job security and to climb higher. Soon enough, the BSN will become the entry level professional nurse. Just like LVNs to an extent, ADNs and diploma nurses may be relegated to settings outside the hospital, ie. ambulatory care, skilled nursing, hospice, home health, etc. Healthcare is always changing. As nurses, our point of entry may be different, but ultimately it is our practice to which we are judged. 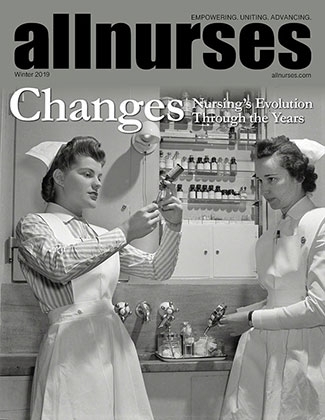 Furthering our education is in our dna as nurses. Has anyone heard of Charles a. Jones college? Hi, Caj has a lot to offer for an lvn school and has improved, I still have contacts there. What questions do you have? does the PVT still work? Yes, my sister did. She all got excited and then found out she failed. Fortunately, for me the PVT trick worked and has proven itself in my LPN and RN exams. So yeah, I know it works. I think there is a certainty that in most cases (the 99% majority) that the trick works, unless you are among the 1% that this happens to. 1 Hour and 25min drive to school to become an RN? It's it really worth it! I drove from Sacramento to Chico, California, 2 hours in each direction, Monday through Friday, 160 miles round trip. If anyone has made this trip, they know it is a 2 lane highway with no scenery but orchard fields, farms, high speed accidents, Indian Casinos, and the occasional bar in the middle of tiny roadside towns. It is doable if you want it. People called me crazy for doing it, but I did it anyways. Just don't listen to lecture on your way home and have hard rock/rap and caffeine to keep your focus. I hope everything for the LVN to RN transition is well for you guys. I started the LVN to RN transition at Butte in Fall 11 and am graduating now on December 13. Hope that you all enjoyed your 1st semester at Butte. ------------- is a great instructor in both theory and clinical. If you guys have anymore questions about the class, or need any books for the upcoming semester, just send me a message. It seems long from now before you finish, but its totally worth it. Good luck to you all. CA LVNs.Where did u get ur IV cert? Same here, I took my IV certification in may, submission at the end of may, and it has not yet posted online. The BVNPT is a mess. There is a contact person at the board who is solely responsible for the IV certification paperwork. So I guess I'm not alone in this delay. Still can't find a LVN job, should I even bother getting my RN license? Roll Call, LPN to RN Students!!! Hello Everyone! My name is Derrick, I am 24 y/o from Sacramento, CA. I have been an LVN for 2 years and a CNA for 2 years as well. I was accepted into the AP LVN to RN program bridge at Butte College in Oroville (near Chico). I am very excited to enter this program as at last, I can finally fulfill my dream of becoming a registered nurse. In the Sacramento area, we have a lot of LVN to RN bridges but the thing is that the requirements and placement are ever getting hard to get into. and at the same token, the acceptances are based on space available (ie. if someone flunks out of the 1st-2nd sems). Alternatively, I was going to go to ISU (Indiana State University) but was shocked by the price of it and clinicals are questionable. Nevertheless, if this is the Lords plan, so be it. I just wanna say good luck to everyone who is going to take the next step to become an RN! PS: Also, a big big big thanks to the guy who created this website, as this has given me a tool for finding info about the right school for my needs. I was once told by my nursing director that there are no rich nurses, maybe for the story of that retired nurse that accepted that multimillionaire inheritance some weeks ago, but besides that you can't get rich by being a nurse. That said, money can be definitely a great motivator. My family comes from a rich lineage of Registered Nursing tradition. - There are five aunties of mine that are BSN RNs, with all of their specialties - My sister and her fiance are BSN RNs - Med Surge - A cousin of mine who is a Nurse Anesthesiologist - advanced practice nurse RN, BSN, MSN; - - Another cousin who is a Nurse Educator for Kaiser, again another RN, BSN, MSN. With two MD uncles of mine, family practice and pediatrics, lets just say, we could in theory start our own hospital. As an LVN, l feel that I am not on the same "playing field" as the rest of my family. At times, during our family conversations, I felt out of place and belittled due to my LVN stature. In the once great state of California, hospitals here are increasingly becoming Magnet status, so its a no go for LVN, or CNA for that matter. I want to be able to meet these standards. As an RN, this is the only way to move forward. I am also doing this for myself. I started at a university of which, had I completed the required prerequisites, it would have guaranteed a place in their BSN RN program. Due to my stupidity and ill, conceived judgment, I partied way too hard and messed around too much. As a result of this, I flunked one subject that put me at a disadvantage with my peers. At 18, I was so fallible that I made the mistake of withdrawing from this program, with all of financing that was in place at the time. Let's just say, one very bad decision had lifelong percussions. Four years eventually wasted. Fast forward to a year ago, my sister's graduation. As I saw my sister graduate across the stage, I did not expect to see my classmates of the program graduate at the same time also. My heart was at envy with these guys. I kept thinking that time of all the time wasted. There was one friend that saw me among the audience, and after graduation, pursued to find me. He found me, and I kept saying to myself this should be me. I should be here celebrating my graduation, with him, my first college friend. I believe that the Lord has a plan. Maybe it was meant to be this way. Coming home from college was demoralizing; therefore, I sought to correct my mistakes. I started as a CNA, then moved on to an LVN of which I am now, and now I am going to start my RN for a year. My road to redemption was not smooth. Our family lost our home to foreclosure. I was lost and had no direction for a time, for which I started to doubt nursing as my profession. As I started progressing through the ranks, I have grown ever more attached to nursing on a personal level. More so than when I had decided at the university level, that I felt due to the family influence, I was forced into it. My mom has been an LVN for close to 30 years in the same skilled nursing facility. Her facility is tough, it is predominately Alzheimers and Dementia residents, and in my opinion, they are some of the hardest patients to handle. She has a great personality and is very good with handling psych patients. I asked her why in that amount of time, that she didn't want to pursue her RN license? Playing the piano was her passion, however, nursing paid the bills and as an LVN offered little new of which to grow. She had to raise a family of four after all on an LVN salary, but despite that, if she had to go back in time, she would have become an RN. Despite the many twists and turns, I believe the Lord has finally gave me a compass to find my lifelong direction. I can continue on the path of which I left off. Earning this RN is not just for me and my perception, but to help me finally advance from my painful past, and ultimately, to pay for the sacrifices and struggles of which my mom had endured to get me to where I am now. For this RN is for you Mom. I love you. California IV certification processing delayed? Hello to all, I have a question for those who have gotten their iv certification in California. About how long did it take for the bvnpt to process the paperwork so that your license with IV certification appeared on the board's website? In my case, I took an IV class here in Sacramento in May of this year and my status online has not changed. The bvnpt has given me the run around and said that they are calling people to ask how many hours the students Classes were, because apparently there have been many providers who have been falsifying their hours. I would appreciate your input as I am running against the clock on an opportunity to become an rn, of which all I need is to show the school that I am IV certified. Thanks for your input in advance. Does anyone have a clue to how long it would take IV certification to post in CA? I took the class in May of 2011 and its been 2 1/2 months since. I contacted a person within the BVNPT and he could not give me an answer. The thing is, I need this as soon as possible because this is all I need to apply for my RN program and while theres available space, I want to send in my application asap. how are you doing with yours? i am trying to meet the june application deadline, but i dont think i am going to make it same here, i won't be able to meet the deadline for fall, have chem still and some other classes. im from sacramento, not too far from the bay, so yeah i would be interested. Just wondering, to whom did you settle for an LVN to RN program? I have contacted ISU lately and so far, they have been informative. The only thing that they mentioned is that if you failed the challenge exams, you would have to go through ISU, which could be a deal breaker. I have most of the prereq's, just have to take chem, but looking for a school in Northern Cali. Like almost everywhere else, wait lists here are ridiculous, and as time goes by, I fear that there will be additional requirements (ie. more classes, recentcy requirements) that might be tacked on. Hi, Im another LVN here who wants to go beyond and do the ISU LVN to BSN. I have done most of the prereqs, completing them in the summer and the fall so that way I can get in the spring next year. What my big concern now is finding a proctor for the challenge exams, the TEAS I will take through Pearson. Does anyone out there know any proctors or proctor services in California, namely around the Sacramento area?